“All that glitters is not gold,” the saying goes. That’s why it is critical for jewelry firms to only rely on a New York CPA firm with specific, in-depth expertise in their industry. Besides accounting and tax services, professionals working with the management of jewelry companies in NYC need to be able to deliver customized, timely advice to ensure the firm’s ongoing success in what is a very competitive business environment. The best jewelers in the industry choose to work with the specialists at Hoberman & Lesser. Our domestic and international jewelry industry clients include retailers, wholesalers, designers, manufacturers, distributors, importers and loose stone dealers. Hoberman & Lesser’s team of professionals also has strong ties to bankers who serve the jewelry industry. 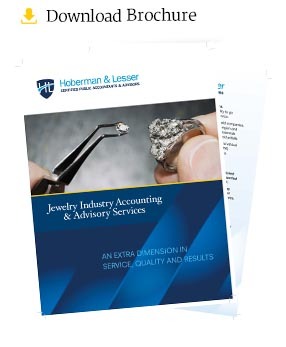 Besides expert accounting, auditing and tax preparation services, clients in NY’s jewelry industry rely on Hoberman & Lesser for advice to help them meet their financial goals and improve their bottom line. To learn more about how Hoberman & Lesser can provide you with the advice you need to better manage your jewelry business, contact Robert Hoberman at 212-463-0900 or e-mail him at robert@hobermanlesser.com. 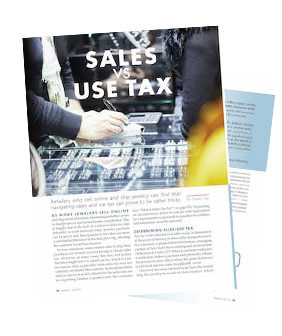 Robert Hoberman was quoted in the article, “Sales vs. Use Tax”, which was published in the July 2017 issue of Rapaport Magazine. You can download or read the article here.